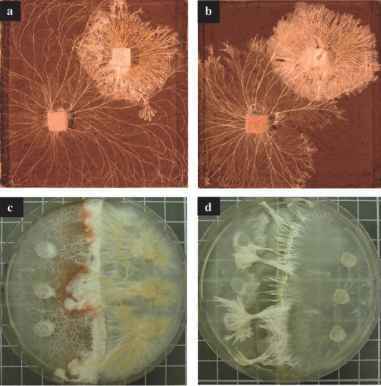 Colonies of saprobic basidiomycetes in the Agaricales commonly bind leaf litter together in both tropical and temperate forests. These fungi regulate nutrient cycling and rates of decomposition, and their litter-binding activity reduces erosion on steep slopes in forests where they are abundant. Published research on the ecology of basidiomycete litter mats is summarized here. While most of the previous work on decomposer basidiomycete ecology has been conducted in temperate zones, the principles are essentially the same in the tropics—it is primarily the relative strengths of various ecosystem drivers and flux rates that differ between temperate and tropical forests. A series of experiments that examined the ecology of basidiomycete litter decomposers in a montane forest on the Caribbean island of Puerto Rico are described: (1) comparison of early leaf decomposition rates with different levels of basidiomycete-induced white-rot; (2) a survey of basidiomycete litter mat abundance along an elevation gradient in the Luquillo Mountains; (3) mycelial mat movements in relation to slope; (4) basidiomycete mat growth and litter trapping rate in response to nitrogen addition; and (5) effects of shading and associated moisture on four litter-binding basidiomycetes, that was part of an experiment testing use of fungal mats to control erosion.